Do we need a device that bridges fitness bands and running watches? A neat device that costs a little too much to be an entry into fitness for most. With the launch of the FitSmart, Adidas is trying to attack a new segment of the market. Having made an initial attempt on the wearables market with the running-focused SmartRun, this cheaper model is looking for the more casual exercise-ist. The price is lower, for one. In the UK it costs £199, where the SmartRun is about £100 more than that. The FitSmart (so called due to another product stopping the chance of seeing the more obvious SmartFit name appearing) is shorn of GPS tracking, a touchscreen and a number of other functions, which allows it to go lower down the price scale. The rubberised watch-style wearable isn't an unattractive option either - it's certainly nicer to wear than something like the Nike+ FuelBand, thanks to having more gradients to control the fit, so it doesn't wobble up and down the wrist. 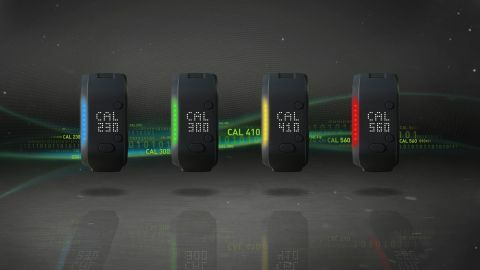 The LED display, which is a little simple, is also nice to look at, and helps create a unique sense of style for the FitSmart, one that means you can easily see yourself wearing it as part of a day to day outfit, rather than solely when working out. This was one of the main issues with the SmartRun, which could display the time without needing a backlight but ultimately was a little too chunky to be classed as a watch replacement. Unlike the FuelBand, the FitSmart isn't meant to be a day to day tracker of everything you do. This means that if won't be able to tell if you run down the road to catch the train rather than taking a little walk, unless you activate the running mode and set it as an actual workout. It's also not able to fully work as a standalone device either, as it needs a smartphone connection to let you set all the functions and workout plans you're thinking of doing to make yourself into a fitter version. This isn't a bad thing, as one of the main foibles of the SmartRun is the fact when you're nowhere near Wi-Fi you can't sync runs (although this has recently been fixed with a recent update) so as long as you've got a smartphone near you, it'll work fine. Adidas believes that the FitSmart, a cut down version of the fancier running watch, will help entice more users to get active. Simon Drabble, Director of Product Creation for Adidas, told me that one of the big issues Adidas is seeing with getting people exercising is the daunting nature of full workout plans, which is why the new wearable shows you weekly goals as you work to a larger target. The range of plans is impressive, and builds on Adidas' heritage in the personal workout space. Everyone, from the couch potato, to the elite athlete, can find something with the MiCoach program, and the FitSmart takes advantage of that. The problem that anyone looking to take running (or other forms of exercise, which are enabled on the FitSmart) to the next level, then this isn't really the right device. Without GPS locating onboard, the accuracy is nowhere near as impressive, meaning that if you really need to clock every kilometre, you've got a too-wide tolerance compared to the actual distance run. The internal accelerometer is OK at working out pace, but it's never going to be as accurate as actual location tracking. However, I think that making this into a bigger problem isn't really fair as the FitSmart is designed to get people active and keep them that way (despite the high price tag), not help more advanced runners get a PB. It's a shame, as there are lots of really nice visual touches beyond the obvious aesthetics, that many runners would enjoy. For instance, the battery life on the FitSmart allows you to keep going for five days, with an hour's running / working out per day, and that's much better than the SmartRun. Similarly, the LED display might be basic, but it's very easy to see at a glance and looks visually appealing too. The side of the FitSmart has the best element of all: a coloured stripe that lets you see which workout 'zone' you're in (an assessment when you first turn on the fitness watch will tailor this to your personal levels) you're supposed to be in. It's easy to spot this out of the corner of your eye when you're lost in your workout, and combined with the vibrations, make it very easy to know when to speed up or slow down. It's something I'd like to see in the next iteration of the SmartRun, or other running watches, where the bezel can glow to let you know whether you need to put in more effort. The FitSmart also has a built-in heart rate monitor, and uses similar optical technology to the SmartRun and the Samsung Gear 2 range. It's pretty accurate, and mostly matches what the SmartRun was telling me in my tests. This, combined with the coloured coaching zones, is an excellent way of training, as basing your effort on heart rate over pace is always going to yield more effective results in the long term. The only real issue I had with the FitSmart is the button on the front of the rubber casing: it's too hard to push to enable different functions. I know that this has have some slight resistance to make sure you don't accidentally press it in normal use, but it should be a simple tap that lets you activate whichever feature you need without checking it worked. The FitSmart from Adidas is a good device for those that are looking to get motivated to become a fitter version of themselves, with the inbuilt training helping to get you up and going. The smartphone interface is intuitive and borne from many years of evolution, and is compatible with all three major phone platforms - which is going to increase the audience for Adidas. The only limiting thing there is the price itself: at £199 €199, it's just too costly for many people, and especially too much of a gamble for those that aren't into fitness, as most of these things are often cast aside after a few weeks. If it were half the price, Adidas would have a strong player in the fitness wearables market, but like the SmartRun this could prove to be too expensive for most.